At 8.15am on the 6th August, 1945, an atomic bomb was dropped on Hiroshima. It exploded 600 metres in the air over Shima hospital, destroying everything below. 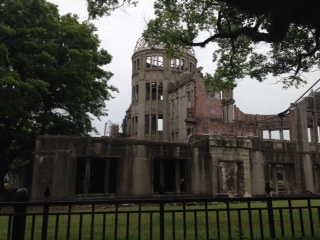 The Atomic Bomb Dome (below) is the first thing you see when you step off the tram at the Hiroshima Peace Memorial Park. It was 15o metres from Shima hospital. There is much complex historical background to the bombing of Hiroshima and Nagasaki. The overwhelming impact of the memorial park was, for me as a visitor, awareness of the extreme suffering that resulted. The photographs of people and animals with severe burns, of the many dead and of the total environmental destruction are harrowing. The circular and beautifully designed Hall of Remembrance in the park is an effective reminder of the names and faces of those who died. However, as is often the case, it is the stories of those who experienced this catastrophic event (the Hibakusha) that make it most real and serve as the strongest memorial. The videos of survivor testimonies make the event unforgettable. One survivor shared a dilemma he experienced as a boy when he met a school friend badly burnt from the bombing. His friend also had burns on the soles of his feet. The man described how he weighed the options as to what to do: Should he suggest that his friend move in the direction of home on his hands and knees? Or should he support his badly injured friend as he walked on his heels? He opted for the latter and helped his friend until adults were able to provide help. 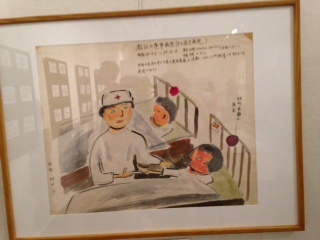 The picture below is in the park museum and is by Hideo Sugayama who wrote on December 13th, 1945: ‘Continued calcium shots at 10am, vitamin shots at 3pm. These days I would have 3 nutritional meals a day plus shots. This is probably why I survived the event though I was exposed at 1.3km away’. 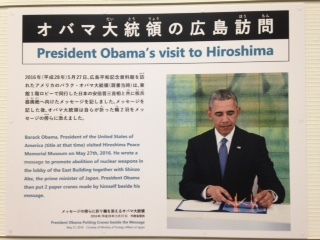 In 2016 President Obama visited the Hiroshima site and gave a powerful and eloquent speech on the significance of Hiroshima and what we should learn from it (see https://www.youtube.com/watch?v=xIotBp0TQEk). The ethical arguments Obama makes against nuclear weapons are compelling. He talks of the need for ‘a moral revolution’ saying that we are part of one human family, with each citizen of ‘irreducible worth’. Japanese school children and other visitors are reminded of this as they visit the park. The Daisho-in Temple is another impressive temple on the island and brings together Shintoism and Buddhism. 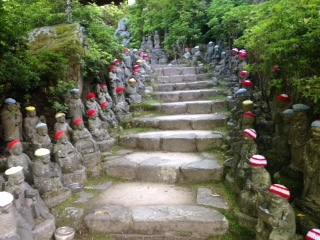 The numerous little statues (below), called Jizo Bosatsu, represent monks in training. I was puzzled by the crochet hats and read that they are likely to be donated by parents who have lost children. The thought of little monks being cared for by having their heads warmed with crochet caps, donated by strangers, was a heartening one to end a memorable day. 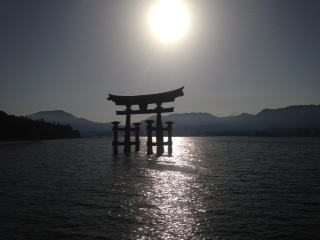 A special thank you to Ms Yusuyo Hata who accompanied me to Hiroshima and Miyajima Island. 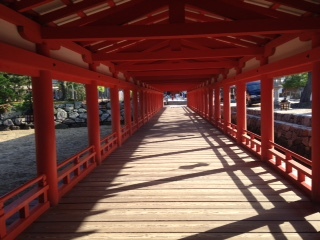 Next week I will tell you about the visits to elder care facilities near Kyoto. You will have to wait one week more for a report of the care facility that uses robots.